Last week, we made a short trip to Seattle for holiday, but of course also to visit Groundspeak headquarters. It was really great. We met a lot of lackeys and of course logged the HQ cache. Below are a picture made in the Signal Cafe inside the HQ and the lobby with the HQ cache. At each product, there is an indication for stocklevel. If it is out of stock, you can contact us for the date when it will be available. This means that if you order before 4pm, it is mostly shipped the same daywith PostNL and in the Netherlands normally the next day delivered. Sometimes, we get questions about the shipping costs for magnets. As this is a very strong magnet material, it cannot be shipped in an envelop. The sorting machines of PostNL will totally destroy you order! Therefore, magnets are shipped as package with corresponding shipping costs. This week some new coins geocoins, a.o. a brand new edition Pocket Decoder. We also have a new trackable for dogs which can be engraved. This time no aluminum, but a real stamped brass edition with nickel plating..
Again, a beautiful pirate coin. Now Blackbeard is on the front. On the backside, you can find "Edward teach saloon" and a skull with swords. Next to the Wulfenit en Dioptase limited editions, we have now also the beautiful shiny gold edition. 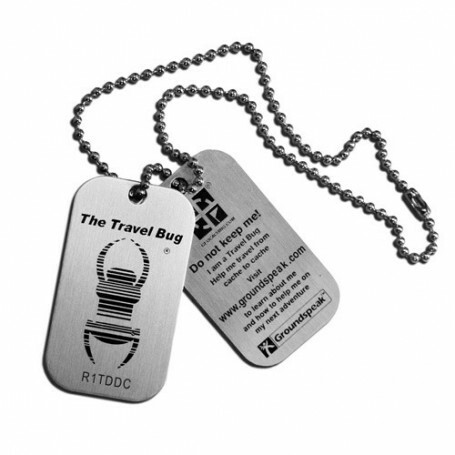 The Pocketdecoder is designed as "functionele" geocoin, which can be used to solve some mystery caches. This Pocket Decoder is delivered in a red velvet pouch. Give your dog now its own trackable! Now available in a cute bone-shape. This is a real geocoin, so stamped brass with a nickel plating and imitation hard enamel. There is also an option to have something engraved on the backside, f.i. the name of the dog and your phone number. You can find these and other new coins on our website in New geocoins. This unique coin consists of two coins that fit together. The outside coin is 51mm in diameter. The inner coin is 38mmen and is attached permanently onto a stud which allows it to rotate. The coin has a shiny gold finish with deep purple hard enamel color. Beautiful earrings, which can be worn as everyday jewelry, not just on Geocaching Events! The Geo - Jewelry - Earrings are very light weighing just 4,5grams ea. The earrings are made of bronze, nickel-free in gold color finish. The diameter if the free-form Geosymbol is 29mm. This earring set is designed for pierced ears. One of each pair of earrings is engraved with a Geocaching.com tracking code. They come packaged in a black valour pouch. We have twee new flashlights from Fenix. For more information about our presence at events, please look at our event calender.